Are you the owner of Denali RV Park in Healy Alaska? Did you know that you can convert this page to a complete listing of your services today for nearly nothing? Put your listing in front of visitors planning their trip to Alaska. Add your own coupons, pictures, services and more. Full advertiser packages available. Contact us today, we're your neighbors and friends so don't be shy. Description - Good Sam's RV Park located only 8 mile north of the entrances to Denali National Park. 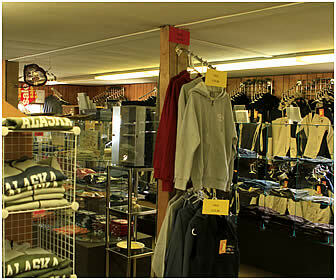 Additional Amenities - Well stocked camping and souvenir store. Find information about the many Campgrounds near Denali Park including RV Parks and cabins for rent too. Savage River Campground in Denali National Park — located at mile 13 on the Park Road. Talkeetna City Park — Tent Camping Only, downtown Talkeetna AK. Talkeetna RV and Boat Launch — located on the banks of the Talkeetna River. 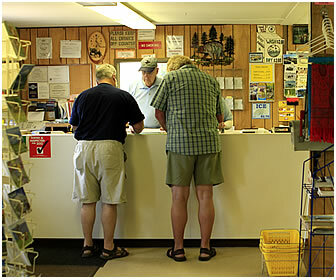 Talkeetna Camper Park — in the town of Talkeetna AK. Tent Camping in Talkeetna Alaska — a guide to camping in Talkeetna. Bear Dance Village and RV Park — Junction of Parks Highway and Talkeetna Cutoff. Montana Creek Campground — mile 96.5 Parks Highway, 18 miles from Talkeetna. Montana Creek State Recreation Site — mile 96.5 Parks Hwy, 36 dry sites packed pretty tight. Chetta's Corner Cache Campground — 54 rough sites best suited for small rigs or tents. Denali Grizzly Bear Resort, Denali Park, Alaska Campground & Cabins. 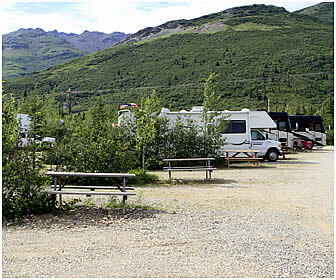 McKinley RV Park and Campground in Healy Alaska. Denali Rainbow Village & RV Park.